So far November has been a very busy month, and we are looking forward to the start of December tomorrow. In November we made the last two CSA deliveries to wrap up our season for 2017. It was another amazing CSA season, and we had a awesome time coming out into the community to delivery our produce to our customers. We are very grateful for all the support and are so thankful that we completed another stellar season. We are just sad its over until next year! With the temperatures dropping and the CSA season over, we have shifted our focus to cleaning and giving some TLC to our field down the hill and our greenhouses. We are still growing both soil and hydroponic lettuce in our hydroponic greenhouse, while we have been power washing and scrubbing our second greenhouse from top to bottom! Everyone has gotten pretty skilled with the power washer! 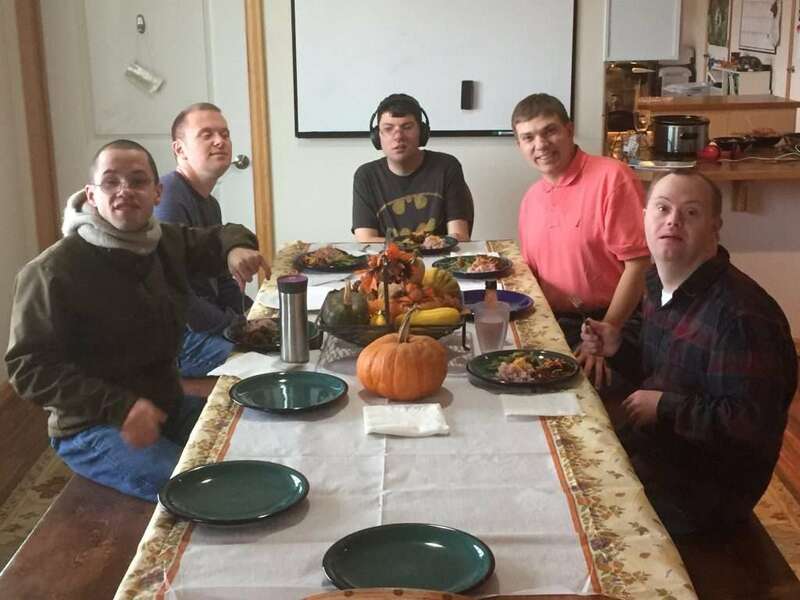 We had a great time celebrating Thanksgiving at Trellis, and made a delicious meal of ham, green beans, and squash. Tyler says the ham was his favorite part! We finished the delicious spread with some pumpkin pie. Our day included some Thanksgiving crafts and a science project where we built different types of boats from tin foil, paper, and balloons to see which design could carry the most pilgrims. We decorated and talked about what we were thankful for and had a great day of togetherness before everyone ventured out to spend time with family. Here at the end of November we visited Gallery One in Ellensburg to create homemade Christmas card art projects. We made a design, cut it out into a stamp, covered it in paint, and printed our designs onto the front of our cards! It was a great time, and all the projects turned out great! If the guys decide they want to, we may write out a few of them to friends, family, and love ones! We hope everyone had a wonderful Thanksgiving, and bright and cheery holidays ahead! We look forward to wrapping up 2017 and spending the end of the year with those we hold dear. Merry Christmas, Happy New Year, and see you in 2018! This entry was posted in Trellis Center. Bookmark the permalink. Fundraising and donations provide most of our funding each year. 100% of donations go directly to Trellis Center’s operations.